The Guardian, Times, Sun, Telegraph, Mail, Metro and Standard report that the sharp rise in adults using crack cocaine in England is being “fuelled by a lack of police” on the streets and aggressive marketing by dealers who offer customers "deals of the day". According to a report by Public Health England (PHE) and the Home Office the drug is being delivered "quicker than a pizza" at a cost £20 to £25 for three bags or wraps. The articles note that PHE reports there has been a 19% increase in adults starting treatment for crack cocaine use. The Government is committed to tackling the illicit drugs trade, protecting the most vulnerable and helping those with a drug dependency to recover. A Joint Committee on Human Rights (JCHR) report into post-Brexit immigration claims that EU citizens will be “left in legal limbo” after the UK exits the EU, the Guardian, Times and Independent report. 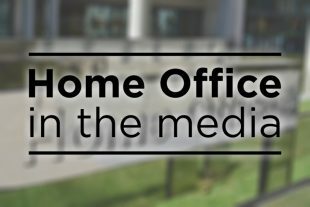 The Home Office’s response is also carried in all print stories. The Government has already committed to protecting the rights of the millions of EU citizens living in the UK. We want them to stay and whatever the outcome of the ongoing discussions about our exit from the EU, we will protect their rights and ensure they get the UK immigration status they need. The EU Settlement Scheme is designed to be as simple and straightforward as possible and during testing more than 200,000 people have applied. Today (Monday 25 March) we launched a nationwide marketing campaign to encourage EU citizens to apply for the scheme, with other activity planned over the next two years to ensure people understand what they need to do.